With GENTEC Electrical Services, we guarantee the highest quality of electric work and all of our Pleasanton electricians are fully licensed and insured. You can expect that our electricians will be able to help you with any electrical need while maintaining an excellent customer service attitude. 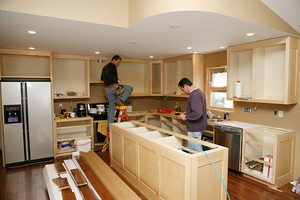 Our staff has years of experience that has given us the insight to deal with any electrical job, big or small. If you are in the market for a new lighting system, need some updates, or just simply need a new appliance installed, our professional electricians will get the job done right the first time, saving you time and hassle. All of our techs are required to go through detailed training and has over 8,000 hours of work experience, in addition to holding all the necessary state certifications to become an electrician. We bring together experience, quality workmanship, and the latest technology to deliver the absolute best service in the entire area. While searching for a top notch company to perform a service or complete a job, there are many things to keep in mind that is not going to show up on a checklist. You want a company that will make neat, clean service a priority with courteous staff who is patient and willing to explain the repairs in detail. This is a key difference between a service that could be so-so, and an exceptional one. We strive to be exceptional, so you can expect to find those excellent technicians that are experts in their field, but also willing to work with you. When it comes to electricians in Pleasanton, there isn’t another service that compares. We’re fast, efficient, customer friendly and ready to serve you now. While you may be tempted to use a local handyman to fix your electrical issues, there is no substitute for a well trained professional. A handyman that does electrical work on the side may know the basics, but do you really want to trust the safety of yourself and your family to someone who does not do electrical work for a living? One error and an electrical fire could reduce your home to a pile of ashes. Saving a few bucks should not be worth risking such a catastrophic disaster. Call us now and get the confidence that comes with a professional. Have you ever gotten a new phone or computer and come to find that in just a few months, it is considered obsolete? Technology moves so quickly, it can be different to keep up. With GENTEC Services, you can expect the latest technology from our professional team so you do not fall behind. For decades, home automation has been a goal even being depicted in movies and television as a sort of dream-like future. By now, we all expected our homes to be in line with what we saw on television like being able to talk to appliances to control them, or sensors that respond to us as soon as we walk into a room. These depictions are not just part of television. There are dozens of devices that can be installed into your home, office, or business that help to ease your day to day life and give you that cool technological edge. Imagine your lighting system in your room. Families have had to deal with people leaving the switch up, or trying to turn on the switch while your hands are full. With our customized lighting systems, those do not need to be a concern for you. We can brighten your household or business in so many different ways. Lighting controls offer you better security to deter thieves, help you save energy (which then saves you money), modernizes the work and living space, helps to set tone for the room or occasion, and puts the power on controlling your lights in your hands. No longer will you have simply have just an on-off option for your lighting. We can install lighting that responds to someone when they walk into a room, or accommodates the room based on how much natural light in coming in. Dimming features let you control the brightness, so it will never be too dark or too bright for your liking. With home automation devices, you will save time and money. Electric vehicles are such a wise investment considering the money to saves you on gas and maintenance, plus they are so much better for the environment. It can be a big step to finally go electric, and many worry about the logistics of charging their new car. You will never have to worry about searching around for nearby power stations, because you can set up a system right in your garage. Car dealerships will sometimes offer you an in home charging system when you buy it, but choosing to go with a trained electrician will save you money and you can go with a company you trust. GENTEC electricians in Pleasanton perform an audit of your home’s electrical output to make sure that your home is ready to accommodate a car charger. If this audit is not performed, you may find yourself with a headache of electrical issues. If we find that it is necessary, we can upgrade your panel during this exact same service call which saves you the time and money of needing to schedule a separate service call. As much as we love our community, it is a fact that no place is truly safe from theft and break-ins. Whether it is at your home or business, a closed circuit TV security system can monitoring your property all day and can protect you in the event of a loss, or help to catch the thieves right away. We offer a variety of options to fit your needs, whether you want just a simple motion detection security system, or a full 24 hours a day monitoring surveillance system. We can advise you during the process, and will keep your wants and budget in mind. You are getting ready for the day and so if everyone else in your home. Suddenly having the toaster, hair dryer, phone chargers, electric shavers turn on all at once and then everything gets silent. You now have to make your way to the side of the house and check the fuse box. An outdated fuse box can not only create this familiar problem, but they can also be dangerous. They can lead to electric problems, shorts, and could even be a fire hazard. To protect your home and family, have a qualified professional assess your fuse box to insure that your home is not at risk. Honesty, integrity, safety, and customer satisfaction are our biggest concerns. We want all of our customers to have the peace of mind that their electrical work will be safe, and that they are not going to feel nickeled and dimed for unnecessary upgrades. This is why we charge by the job, not by the hour, so you know how much you will be paying before the job is started. And whatever price is quoted to you will be the price you pay. If unforeseen circumstance led to the job taking longer, that does not mean you have to cough up more money. Whatever your electrical need, in your home or your business, GENTEC Services is standing beside you. Call us today at 925-373-1682, to schedule a consultation, or fill out our online service request form. Our Pleasanton electricians are waiting for you! We also serve San Ramon, Dublin and the rest of the East Bay area.